I first posted this one-pot White Chicken Chili recipe back in January 2011 and I thought both the recipe and the photos were in need of an update! I made very minor tweaks to the recipe to make it easier to follow and I upgraded the photos since the previous ones were not so appetizing. 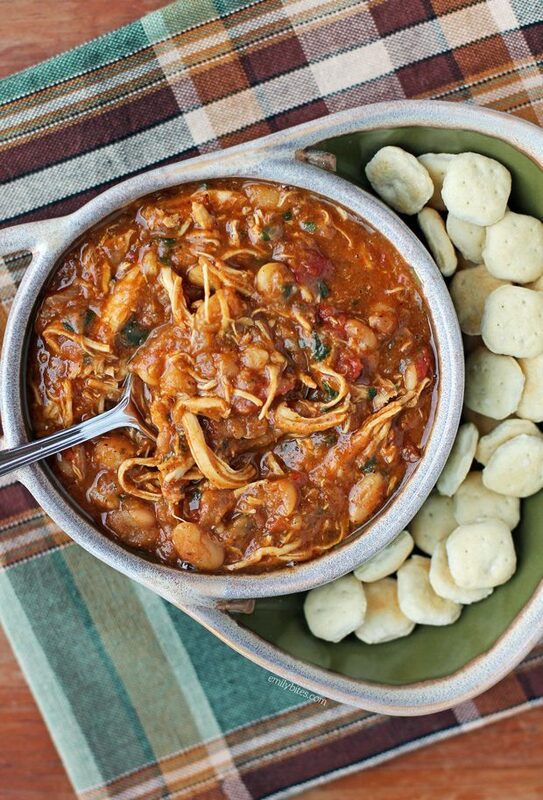 This White Chicken Chili is super healthy, hearty and flavorful, so hopefully the refresh will get this recipe on more readers’ radars (and in more of your kitchens as well!). I love that this comes together all in one pot and it’s super easy to make – perfect for the colder days ahead! Plus, a serving of this chili is 291 calories or just ONE Weight Watchers SmartPoints. One! I make a big batch of cooked, shredded chicken fairly frequently so that I have it on hand for recipes like this, and also to just use in salads, sandwiches, wraps, etc throughout the week. My favorite way to do it (also the easiest way, in my opinion) is to just toss it in the slow cooker with some water or broth. In the end it basically shreds itself! If you want complete instructions for this super simple method, I outline it in this Easy Slow Cooker Shredded Chicken post. Looking for more warm, comforting soups, stews and chili recipes? Check out my Sausage and Tortellini Tomato Soup, Butternut Squash Soup, Beef Taco Soup, Buffalo Chicken Soup, Creamy Chicken and Wild Rice Soup, Best Turkey Chili, Slow Cooker Beef and Barley Soup, Zuppa Toscana, Broccoli Cheddar Soup, Slow Cooker Beef Stew, Italian Wedding Soup, Chicken Corn Chowder, Cheeseburger Soup, Spaghetti and Meatball Soup, Chicken Tortilla Soup and more in my recipe index! Bring oil to medium heat in a large pot or Dutch oven. Add the onions and sauté for 5-8 minutes or until tender. Add the chili powder, garlic and cumin and stir to coat the onions. Cook for 2 more minutes. Add the oregano and beans, stir and cook for 30 more seconds. Add the broth and reduce the heat to medium-low. Simmer for 20 minutes, stirring occasionally. Remove 2 cups of the bean/broth mixture into a blender (or container for an immersion blender) and process until smooth. Return pureed mixture to the pot. Add the chicken and tomatoes and cook over medium-low for another 30 minutes, stirring occasionally. Add the cilantro, lime juice, salt & pepper and stir to combine before serving. my bf is a big fan of your recipes, so i decided to make him this chili. it was a hit! super tasty and very filling. thanks for the recipe! Just made this tonight – husband loved it! Will be making it again, thanks for the recipe. Hooray, glad it was a hit! Burnt it 🙁 Didn’t know what heat to cook it over and guessed medium. Bad choice. I made this last night and both my husband and daughter loved it (and of course I did as well)! I just started back to WW and have had my eye on a ton of your recipes. Thank you!! Anonymous #1 – Sorry it didn’t work out. I hope you’ll try it again, it’s delicious! Anonymous #2 – So glad it was a hit with the whole family! Delicious! I added spinach at the end and it was a hit! A lot of us are counting calories, fat, carbs and protein, so it would be VERY helpful if you would list those things on ALL of your recipes instead just on some. Rude Much? She is doing YOU a favor by giving you a recipe….I would probably suggest you not use her site if it causes you undue hardship. I think the problem is the carbs here. VERY carb-heavy recipe. Any idea on what the calorie count is for this? This is the best White Chicken Chili I have ever had. Taking it camping with us this weekend! Do we know how manysmart points this is? I’ve been updating my recipes with SmartPoints as quickly as I can! I’m working my way backwards and I’ve finished 2015-2012 and about half of 2011. I’m working on finishing 2011 and 2010 – it’s a lot! If a recipe doesn’t have SPs yet it’s because I haven’t calculated them yet, but I will get to it soon! If you want to make it before then try plugging the ingredients into the WW recipe builder. Thanks so much for your patience, I hope to get here ASAP! FYI….this recipe calculates to 6 Smart Points per serving according to the WW recipe calculator. Hi Emily, this recipe looks very yummy! I don’t think we have diced tomatoes for chili in France, so I’ll be using normal dices tomatoes. Is there anything you’d recommend to substitute for the lack of “tomatoes for chili”? Hi Margaux! Do you have normal canned diced tomatoes? You can just use those and add a bit more chili powder to taste. The ones “for chili” are just seasoned. This is very similar to the recipe I use but I have always added carrots to just add a vegetable to the soup. I never thought to add diced tomatoes so I will add those next time! Thanks for the update! Is the recipe 1sp now ? I have never tried making it in a slow cooker so I can’t give specific instructions, but if you try it out please report back! This is my *go to* chili recipe – it’s a hit with everyone who tries it – and no one ever guesses it has pumpkin! I’ve been making it regularly for the last year, and thought it was high time I thanked you for this wonderful, easy recipe! We like things spicy in my household, so I double the seasonings and throw everything in the crockpot (I cook the turkey and onions in a skillet first). You can only imagine how excited I was to see the revised points value on Weight Watcher’s Freestyle update this morning! Love, love, love your recipes!! Hi I would love to do this recipe but I have dry white beans how can I incorporate in this recipe? I have never tried this using dry beans so I can’t give specific instructions, I’m sorry! i am totally confused about the points and “0” point food. this chili recipie uses all “0” point foods except for the oil. if i eliminate the oil will it be a”0″ point food that i wont have to limit my intake to 1 cup? Haha, don’t feel limited, even with the oil a cup is only 1 point! You shouldn’t be afraid to use your daily points. If you plug the ingredients into the recipe builder in the quantities listed then the oil, chili powder and broth all add to the points. Chili is very filling so I think you’ll find a cup is more satisfying than you may think, but if you prefer to leave out the oil you are certainly welcome to try it that way. Enjoy! I haven’t made this yet but it looks delicious. Can you tell me the reason you use the blender for the 2 cups? Curious to understand why. Thanks! Blending a portion of the beans/soup makes it thick and rich and delicious! I add a green pepper, chopped into fairly large pieces, to this recipe. I saute it with the onions. Love the taste of green peppers in any chili. Also, with this only being 1 smart point in the freestyle plan, you can afford to sprinkle a little reduced fat cheddar over each serving. To the person who only has dried beans, I suggest planning ahead and cooking the beans up before making the recipe. LOL this isn’t white chili. It’s red. Hi Emily, my freestyle at Weight Watchers kicked in today. Can this chili be done in the crock pot on low? Thank you. I’d also love to know if this recipe can be made in the slow cooker, with the chicken cooking alongside everything else and shredded afterward! I loved this. It is hearty. I loved the lime and cilantro and the shredded chicken. This recipe is a keeper for the new freestyle plan! Made it today in the crockpot – mine tends to run really hot, but I put in the broth, seasonings, orange pepper, can tomato sauce (I’m a tomato hater and that’s as close as l’ll do), and 2 cans of the beans on low for a few hours. Blitzed it with the stick blender and added in a bunch of shredded chicken and the other can of beans and let it go for another hour or so. Then added the fresh cilantro and lime just before serving. Soooo good! Would probably decrease the broth next time since it doesn’t evaporate much in the slow cooker. If I didn’t have chicken ready, I think it could definitely cook with the beans and broth and you couldn’t just take it out and shred it before using the immersion blender. Thanks for updating this one Emily! Made it tonight. Chilly outside and this chili warmed me up inside. Thank you so much. Hi Michelle – I like the thought of adding pumpkin to Emily’s chili recipe. I live in Toronto, Canada and the only size of canned pumpkin I have found here is approximately 4″cups which would REALLY add to the fibre content! How many cups do you add? The recipe without the pumpkin sounds yummy but I do like the thought of your addition. 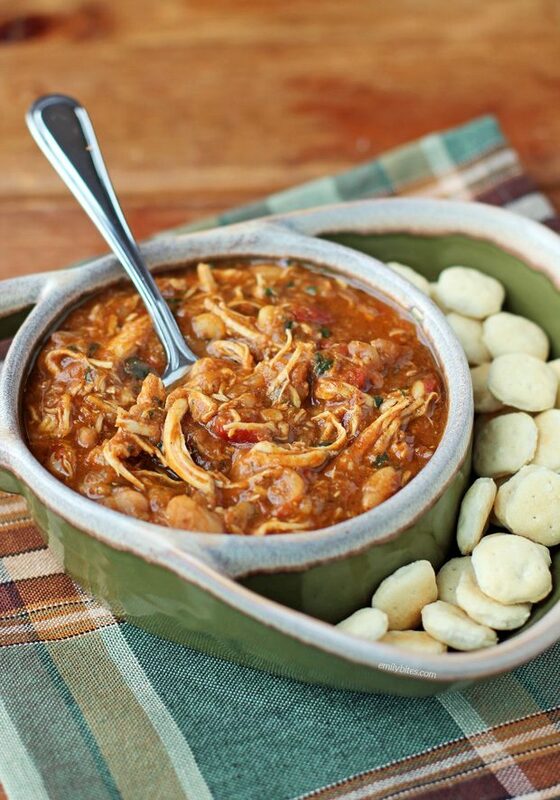 This is the best Chicken Chili recipe I’ve ever made. Thanks so much. Love your blog. Would like to make this and freeze in single serve containers. Not sure what to do about the cilantro and lime juice. Can I add them in before freezing? Sure, that will be fine! This is the second recipe that I’ve made of yours and it was absolutely delicious! Thanks so much for sharing! Just curious why it’s 1sp? Which ingredient am I missing that has points? Oil, chili powder and chicken broth all have points in the quantities used. Enjoy! Does anyone have any suggestions as far as using a crockpot? I plan to make this tomorrow morning and would love any advice that could be given. Thanks in advance! This looks and sounds incredibly tasty & I will have to try it now that my husband has started WW Freestyle. (Well, me too sort of. haha.) I’m just curious how it’s a “white” chili though?? Any white chili I see is creamy…and of course, white. This looks like a regular chili, only with chicken instead of ground beef. My family has always called it that because it uses white beans and chicken breast instead of red beans and red meat. *shrug* If the name of the recipe bothers you feel free to call it whatever you like! I can’t figure out where the 1 point per cup is coming from. The only ingredient with points is the oil ????? The oil chili powder and broth all have points in those quantities. Hope that helps! Can I use regular chili beans instead of the white beans? Have you or anyone you know tried this? Just wanted to note for anyone who’s curious, this recipe is super easy to adapt to your tastes. I like more veggies in my chili so I always add some at the second stage when I add the chicken and tomatoes (chopped peppers and cauliflower are the best Imo). Also extra tomatoes or even crushed tomatoes to account for the extra veggies. Any type of bean you like will also taste great. Personally I double the spices and it comes out so flavourful you don’t even need the lime or Cilantro. This is an awesome base recipe that can suit lots of different tastes! Made this today and it is delicious! It is a bit spicy for me, not sure if it is because I used chipotle chili powder or not. I will probably decrease the amount of chili powder next time. I used just regular diced tomatoes and it was still very flavourful. Everyone in the family loved it! I just joined WW so you’re website has been very valuable to me. My husband said that this goes into the rotation! Thank you! So so good everyone loves it and it’s hardly any points !!! This was so good! I made this for the super bowl. I added and extra can of diced tomatoes but that was the only thing I did differently. Will definitely make this again. I make this in my crock pot. I use whole uncooked boneless skinless chicken breasts. I just toss the main ingredients (onion, beans, broth, raw chicken, seasonings and tomatoes) in and cook on low till I get home from work (about 8 hours). Since it’s 0 points now, I also add corn when I get home and stir it into the hot chili. That warms the corn up. Very flavorful. I added corn and substituted the beans for black beans. Added two more points, but tasted fantastic!! !